Work is underway on Acworth's much anticipated Depot Park at the corner of Main and Lemon streets in Historic Downtown Acworth. The park is slated for completion in early 2019. The project includes construction of a 1,000-square-foot replica of Acworth's original train depot, which will house a history center; a landscaped pedestrian plaza with seating; and the Acworth clock. The clock was removed from Main Street when construction started in fall 2017 on the city’s major downtown redevelopment project. Depot Park, which is part of the redevelopment project, is budgeted at $850,000 and will be funded through bonds issued by the Downtown Development Authority. Two-thirds of the depot building will house the history center, which will feature an electronic kiosk that displays professionally produced videos and oral histories conducted with longtime residents, and scrolling historic photos and storyboards that tell Acworth’s history, according to James D. Albright, director of Acworth Parks, Recreation, and Community Resource Department. The other third of the depot building will offer exterior-facing public restrooms to serve the downtown area. 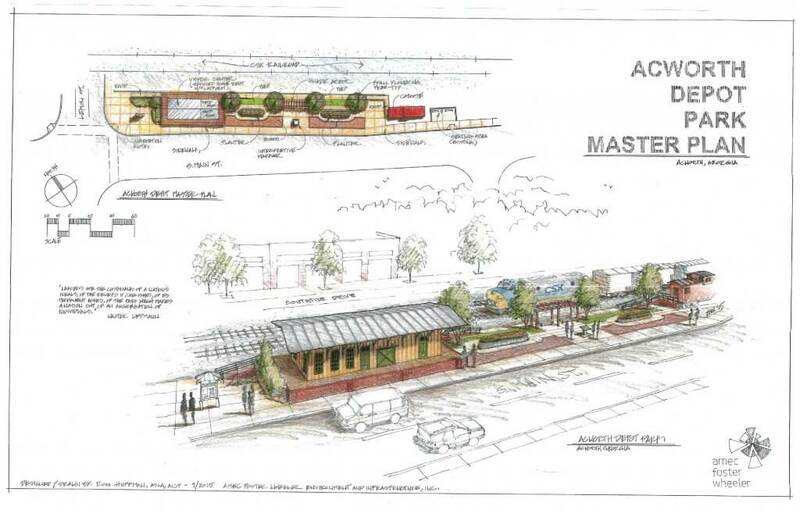 The center will be located next to Acworth’s beloved red caboose. A groundbreaking for Depot Park was held in September. The event was hosted by the city of Acworth, the Downtown Development Authority and Save Acworth History Foundation. The foundation has worked to raise money for production of the oral history interviews, and to collect digital images of historic significance to place in the center. Tom Scott, professor emeritus of history at Kennesaw State University, donated his time to conduct the oral histories, but the videography costs $350 per interview. Other downtown redevelopment projects under construction include a 46,000-square-foot community center, at the corner of Logan Road and Cherokee Street, which is slated for completion in spring 2019; a pedestrian railroad overpass; a two-way boulevard to connect Lemon Street at the railroad tracks to the Logan Park expansion; a roundabout at the intersection of Lemon, School and Cherokee streets; and the addition of downtown parking and wayfinding signage. The $11.5 million community center will include banquet space for 350, including a catering kitchen, two full basketball courts with a retractable divider, a raised indoor walking track, two multi-purpose rooms, group exercise space, recreation offices and parking to support the facility. Money to build the center will come from the 2016 Special Local Option Sales Tax (SPLOST), Cobb County and the city of Acworth. Another redevelopment project, Art House, opened in December 2017. It is home to nonprofit Acworth Arts Alliance. The center hosts exhibits and offers classes taught by local artists for children and adults. For more information about the redevelopment project, go to http://acworth.org/downtown. – Carla Caldwell, editor of Around Acworth.